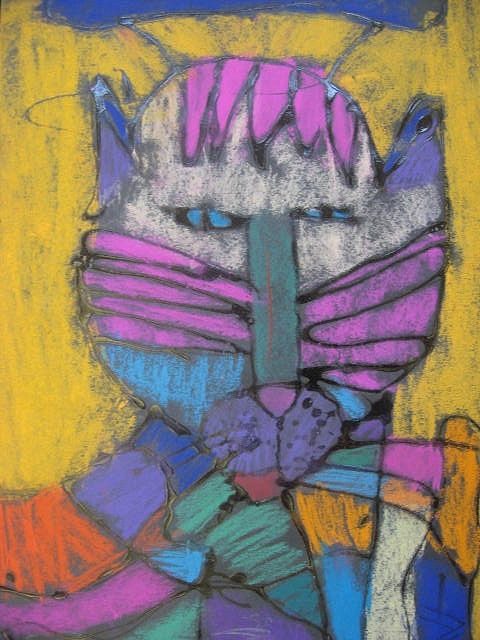 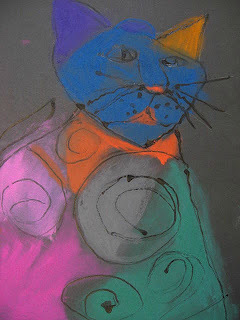 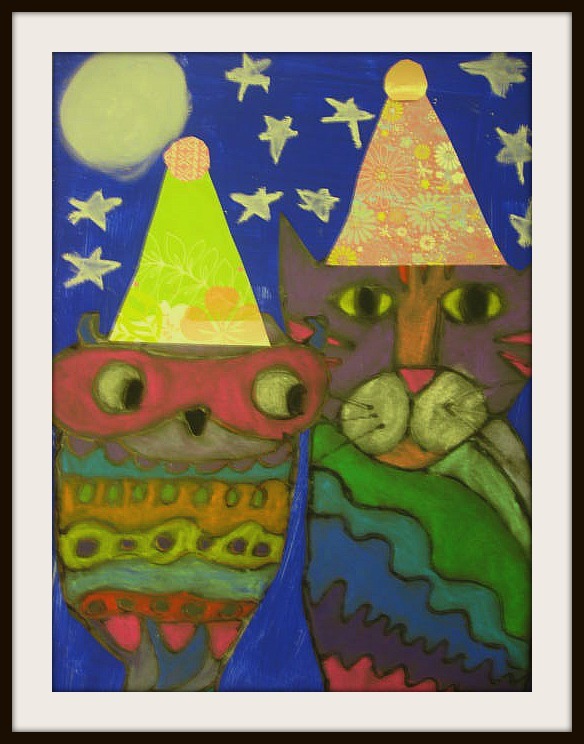 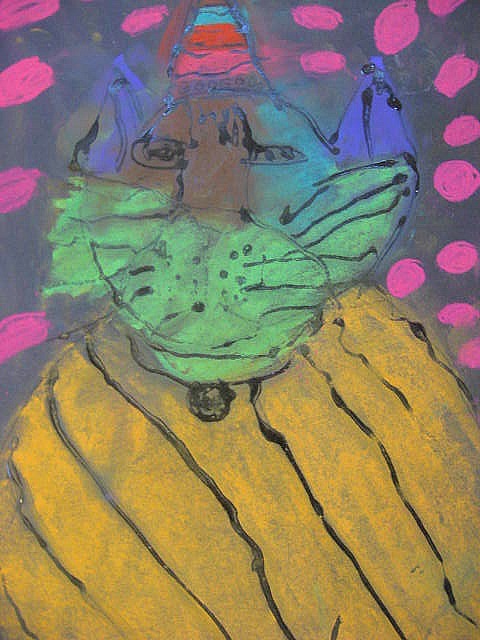 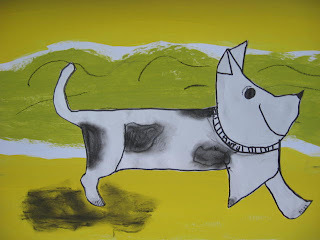 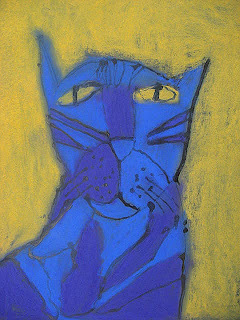 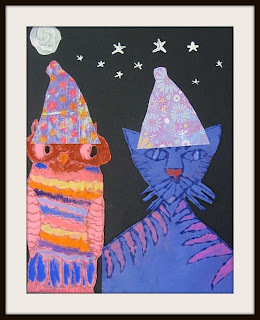 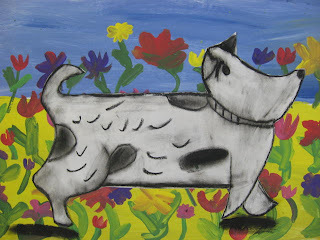 The glue and chalk pastel cats I did with my three Animal Art camps were such a hit with the kids, I decided to do a take on the idea with my Children's Book Art Camp. 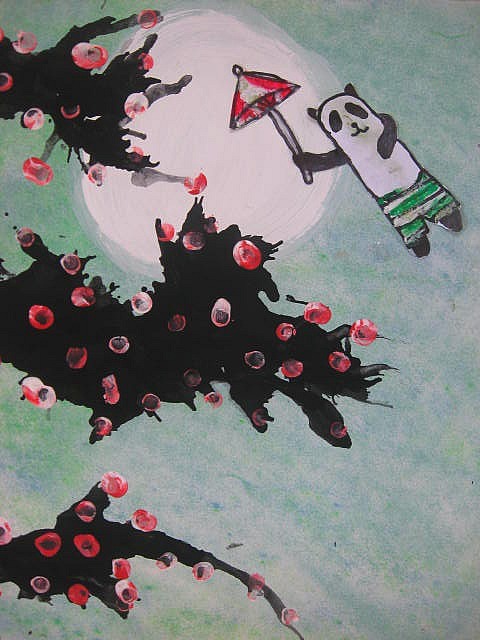 Rather than looking at a published children's book inspiration the children (5-9) were given the assignment to create the cover illustration for their own short story or poem about an owl and a cat. 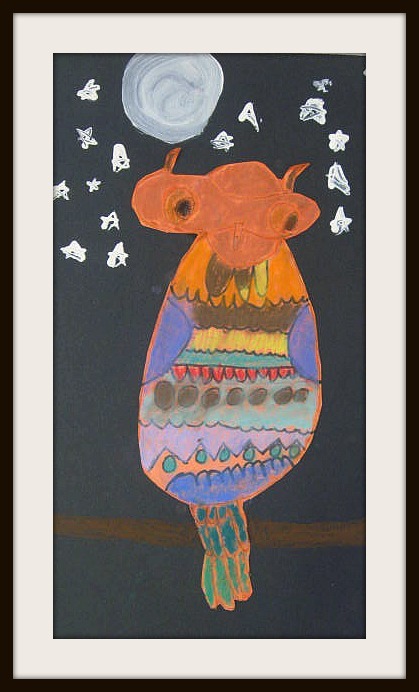 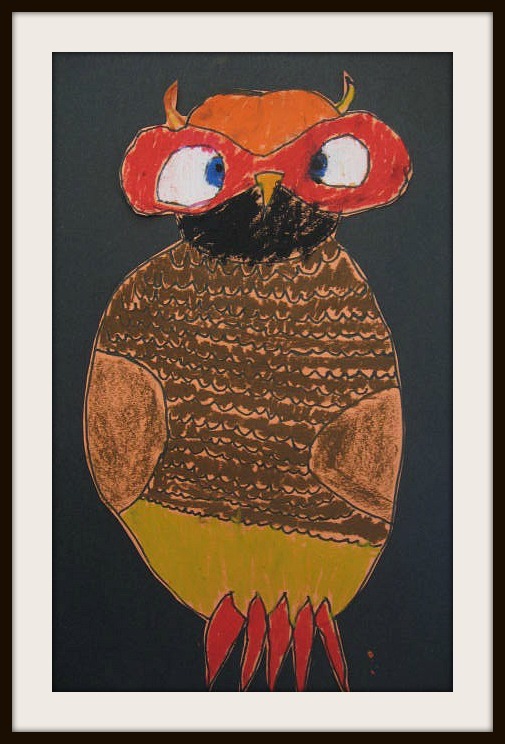 We created our owl and cat separately on long sheets of colored construction paper. 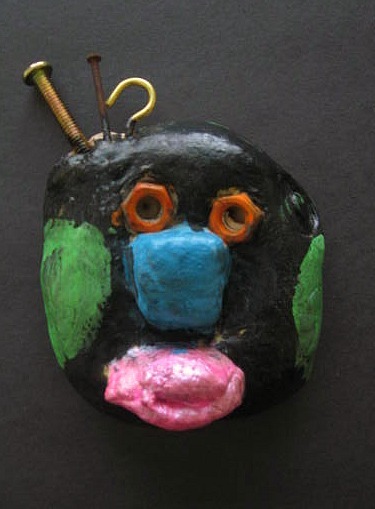 They could choose any color they wanted. Their pencil designs were gone over in glue and the next day chalk and sometimes oil pastel. They were cut out and glued to a black board where they could finish their piece with moon and stars or even party hats using scrapbook paper. I loved seeing the effort the children took in creating these. 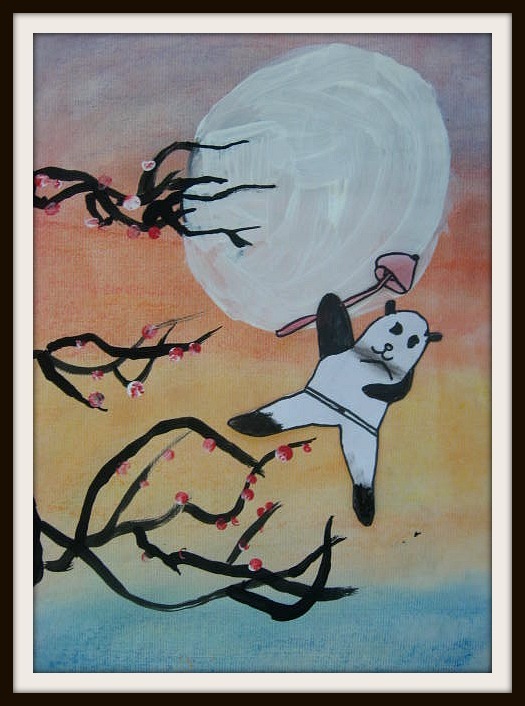 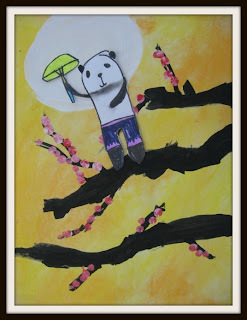 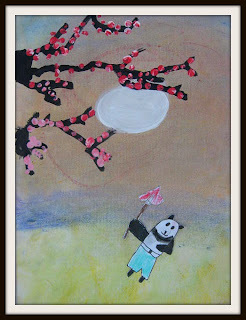 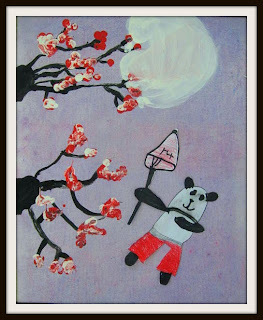 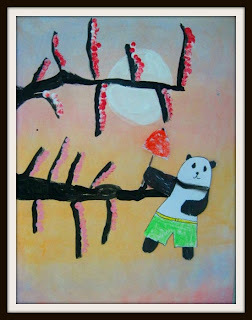 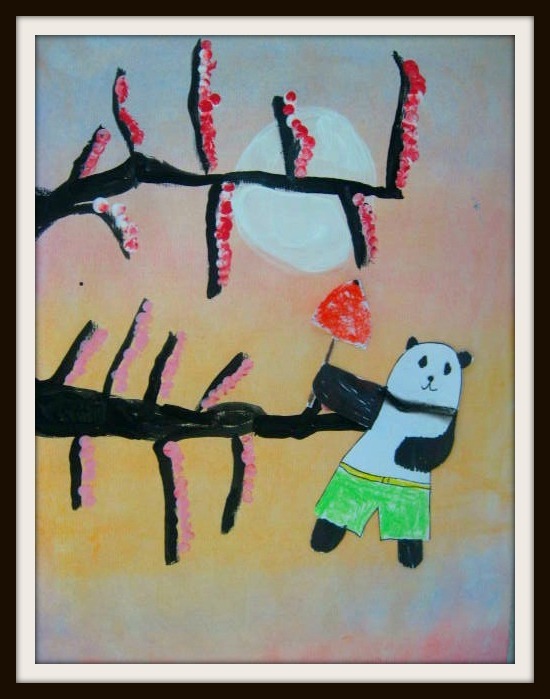 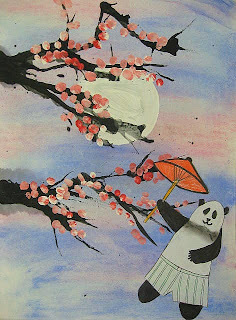 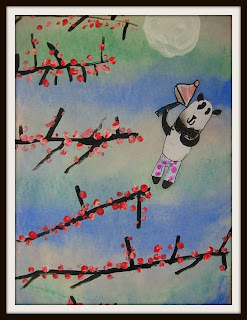 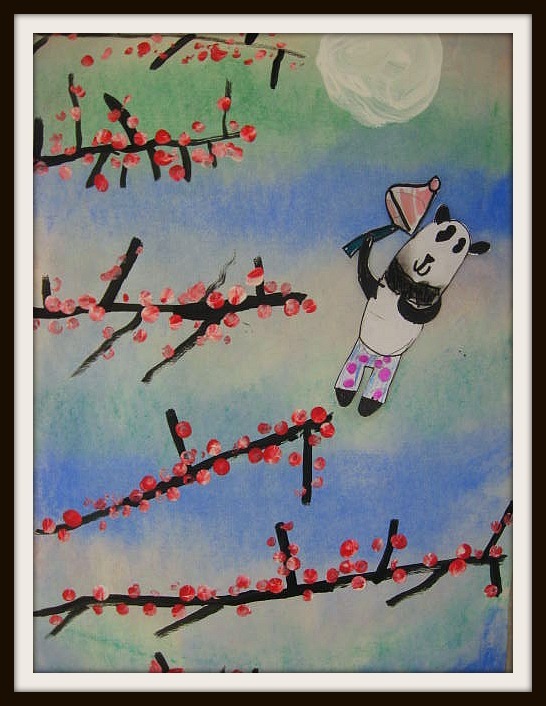 My Children's Book Art Camp group (ages 6-9) did a beautiful job with their art inspired by the book, "Zen Shorts." 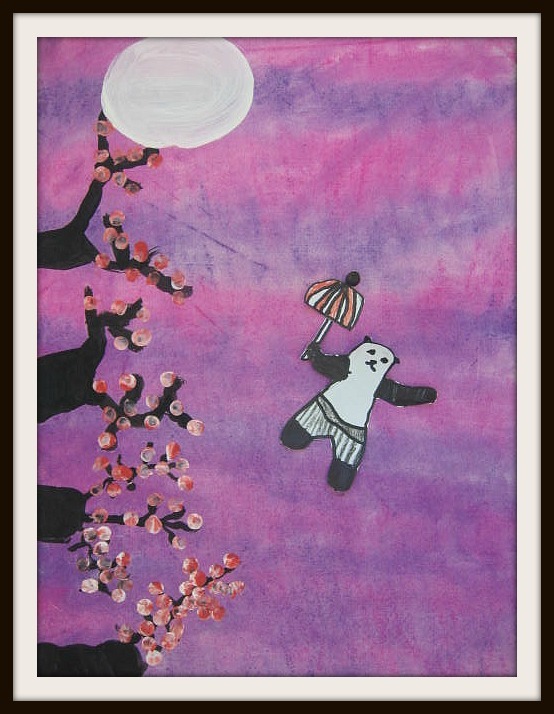 They created the sky with chalk pastels but painted their branches rather than the straw blown technique of my last group. 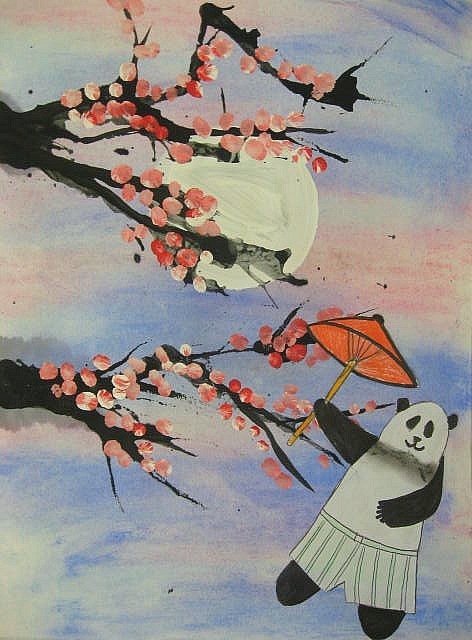 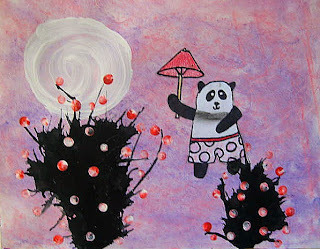 Pandas were created on a separate paper and glued to their zen backgrounds. 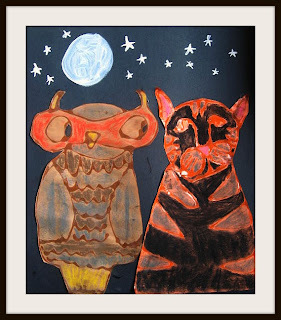 My third and final Animal Art Fun Camp met last week. 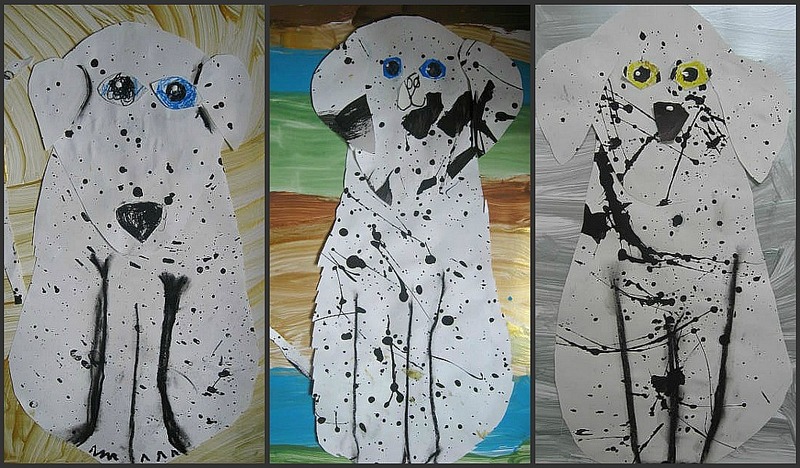 What a sweet group of kids! 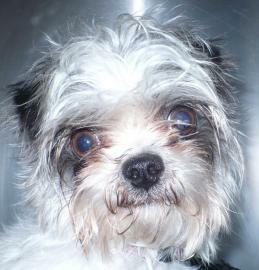 Once again Dylan was our appointed model. I thought his big eyes and tousled hair made for a great expressive painting. 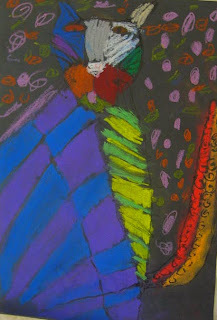 We created our eyes using oil pastels, later adding reflection dots with white paint. 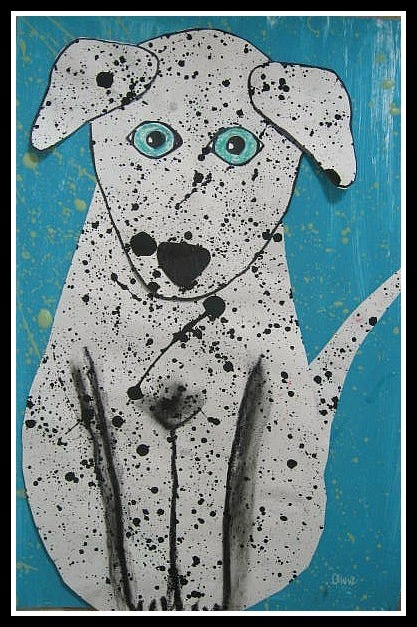 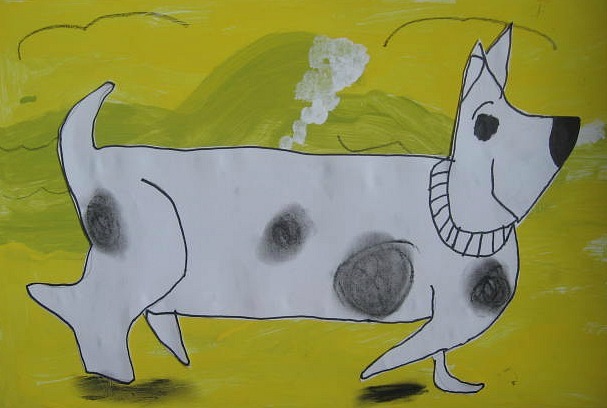 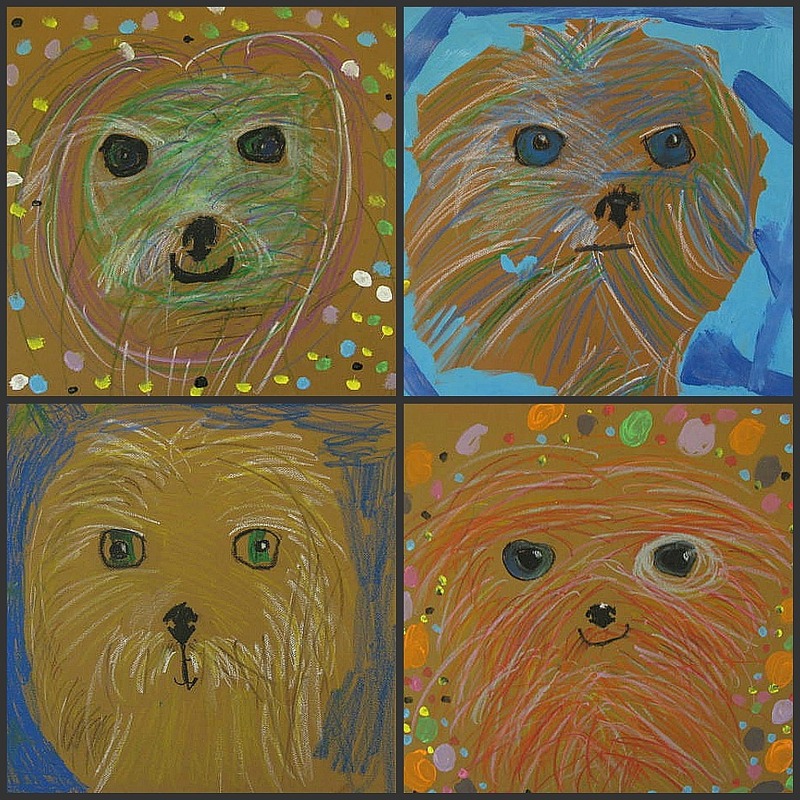 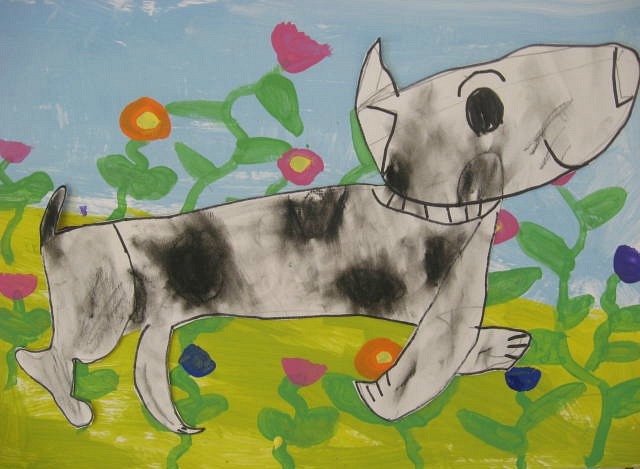 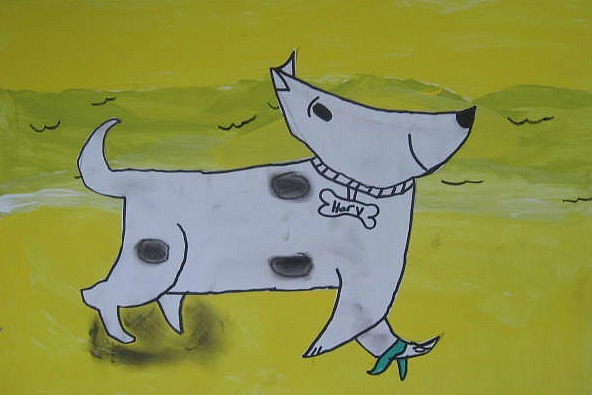 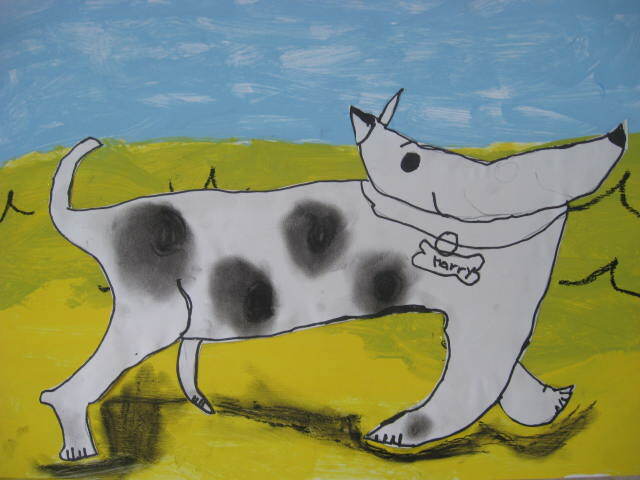 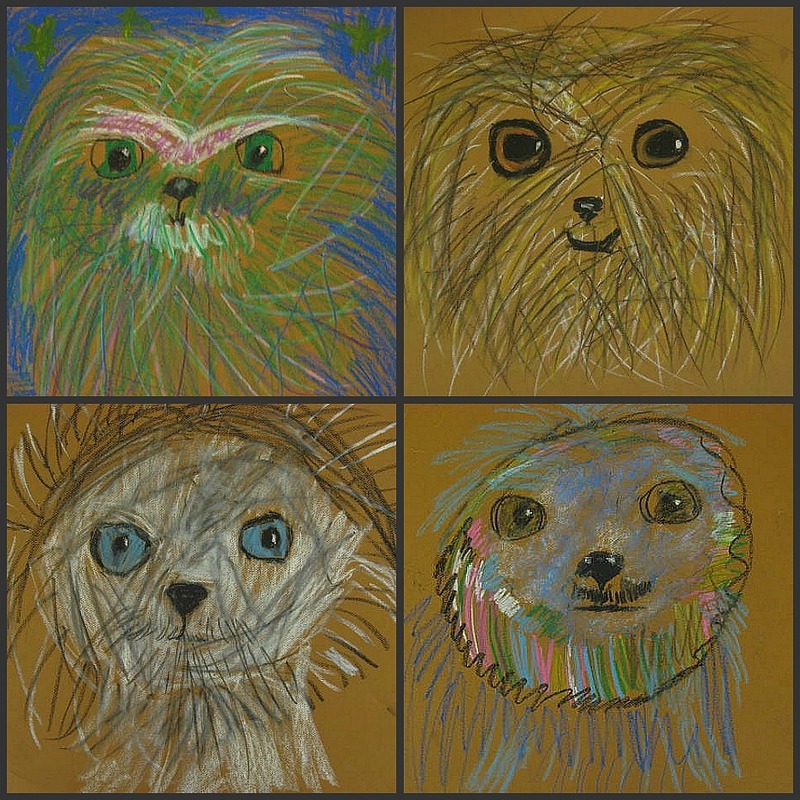 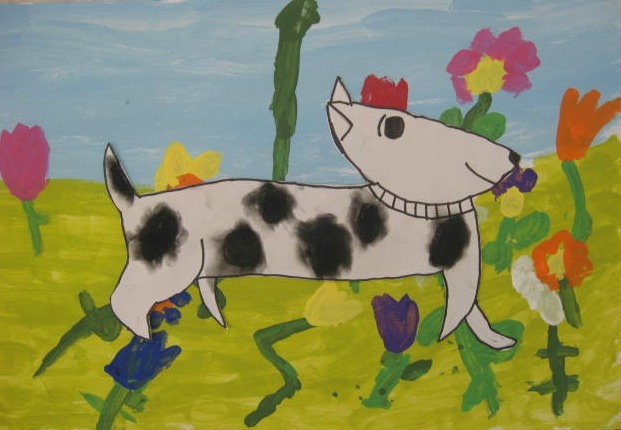 Children chose a warm or cool palette to create their dog with loose brushstrokes and a color on the opposite side of the color wheel was chosen for the background. I'm now ready to create the poster for the SPCA of Reno with a beautiful collection of artwork from three groups. I'll be sure to post it later. My Messy Art Fun Camp is over. I had a wide age range for this class, K-6th. 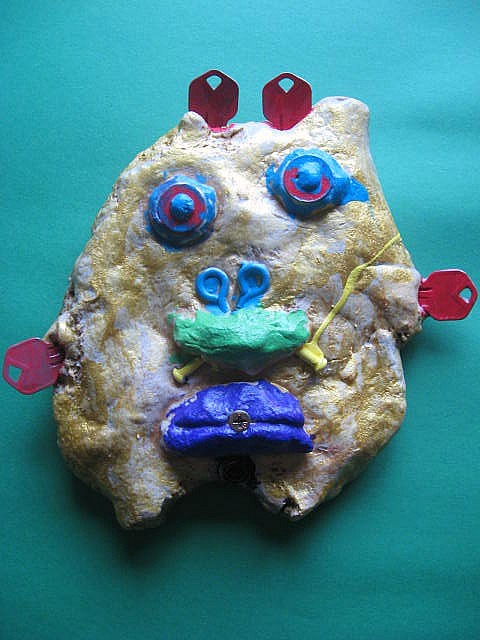 We created Kimmy Cantrell salt dough masks, pinch pot clay creatures, non-objective art collages and glue and chalk pastel creations. 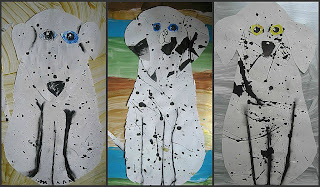 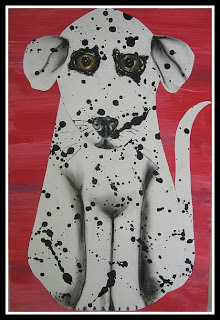 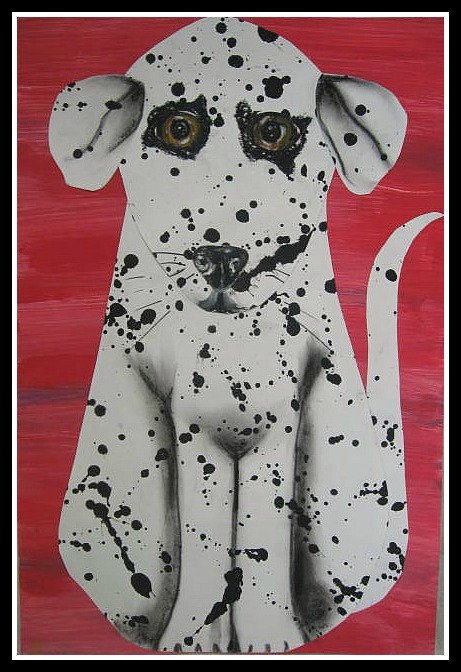 But the favorite project for many was the splattered paint dalmations. 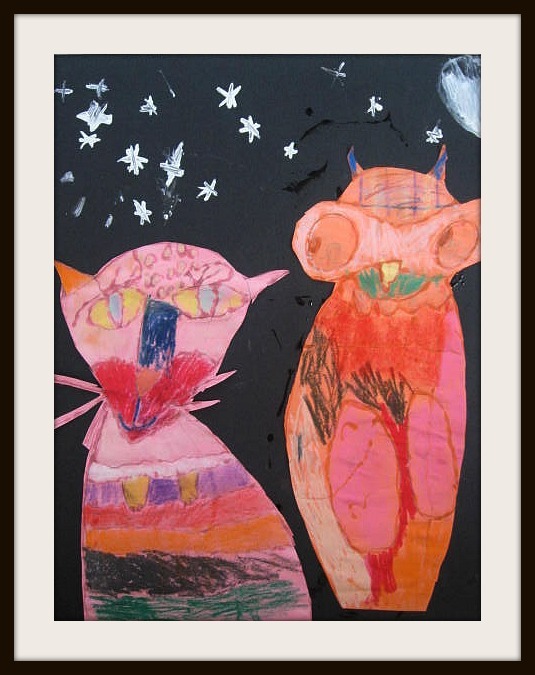 The children splattered 2 long sheets of construction paper on day 1. Once dry, they cut out a simple body shape, head and ears. Eyes and nose were added and charcoal shadows. 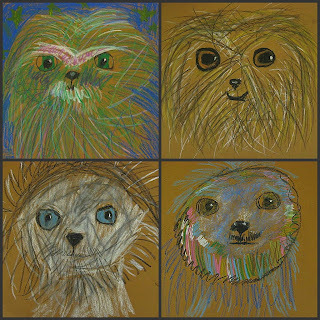 They were given free reign in creating their background. A BIG thanks to Erica from Art Project Girl for her post about the magical book, "Zen Shorts" by John J. Muth. 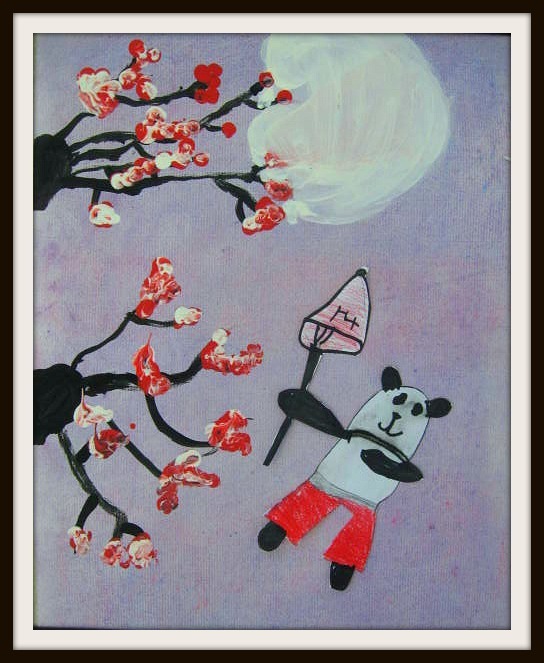 Also thanks to Anna at Imagine, Explore, Create for her idea of using chalk pastel background for the straw blown ink cherry blossom trees. I thought the results were wonderful. 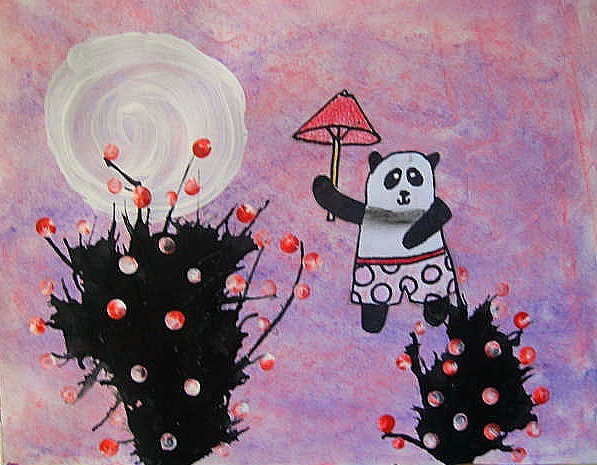 After Erica's recommendation, I purchased a used but flawless hardback copy from Amazon. 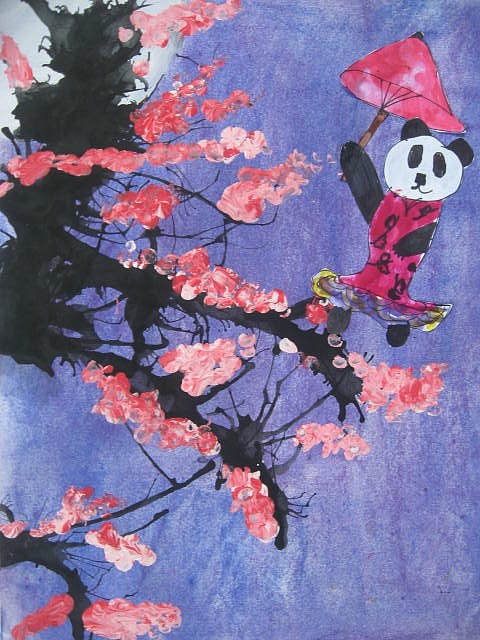 The three stories the Giant Panda, Stillwater tells his three neighbor children have roots in Zen Buddhist literature that have been passed along for centuries. Muth's beautiful watercolor illustrations have earned him a Caldecot Honor. 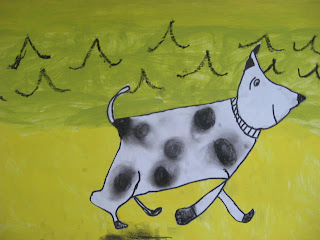 This book really is a gem. The children first used chalk pastel (blending with their fingers) to create their sky. They then painted a moon in white acrylic. 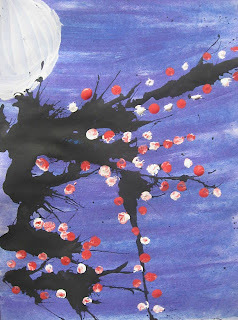 Some watered down black tempera was dropped along the side of their page and blown with a straw to create branches for their cherry blossoms. 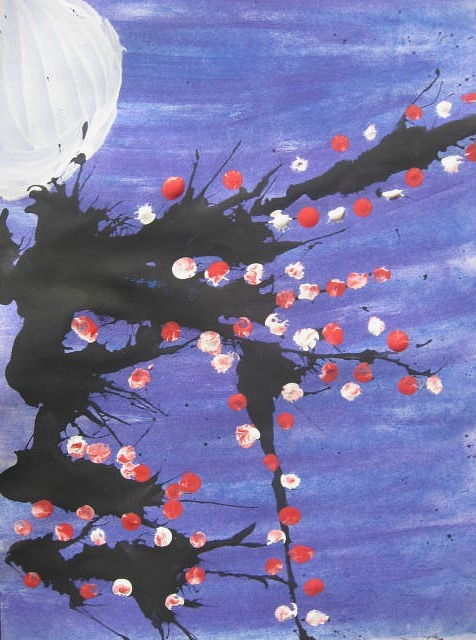 Once dry, they dipped a pencil eraser in white and red to create blossoms. On a separate paper we drew a simple panda that was colored with markers and colored pencils and cut out and glued to their background. 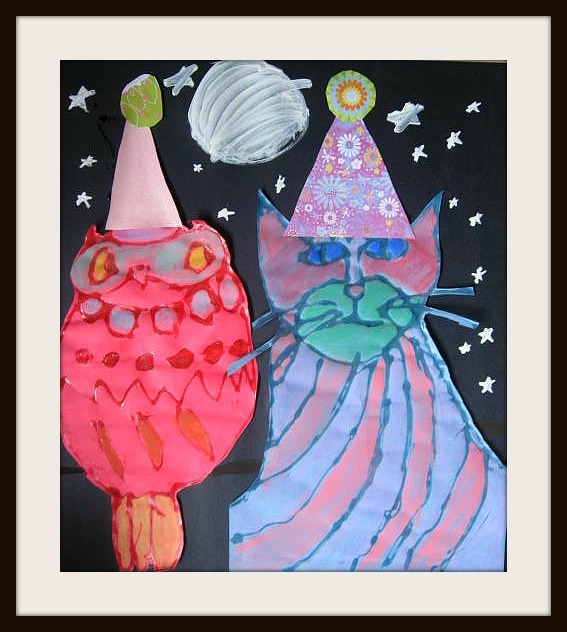 I will do a revised version of this project with my Children's Book Art camp in a few weeks. 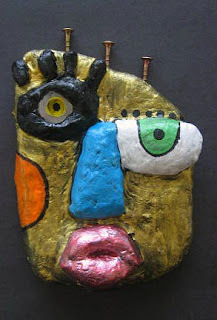 I have done cardboard masks inspired by the work of sculptor, Kimmy Cantrell. 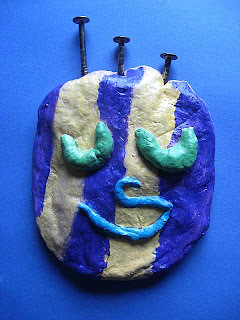 I had seen some wonderful clay masks at Mrspicasso's Art Room. 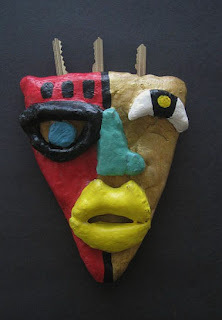 I thought I'd give it a try with salt dough with my Messy Art Fun camp. 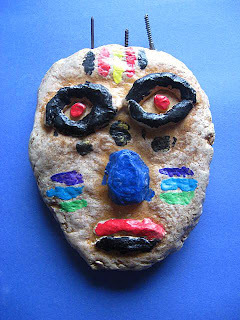 After creating a face base we formed bold facial features using small pieces of dough. 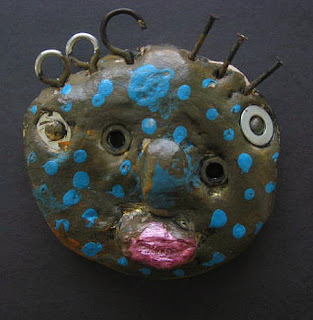 We used bits of hardware like Cantrell to accent our faces. 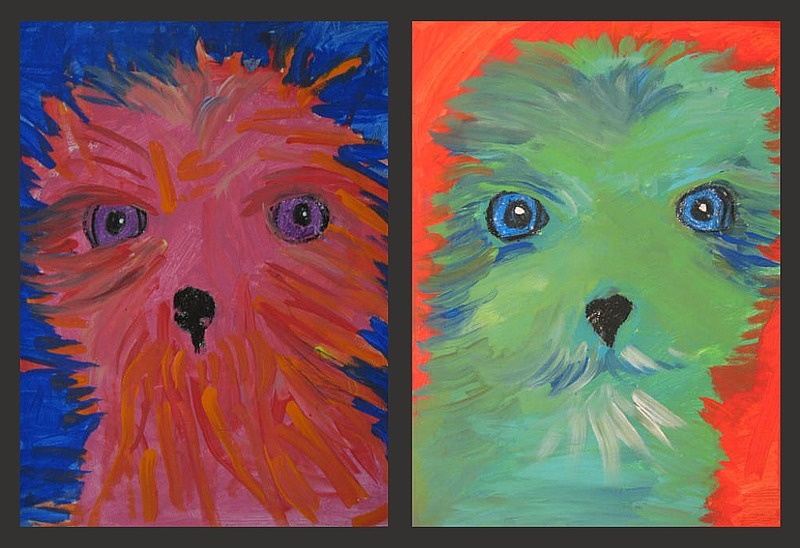 We baked them until hard and painted them with acrylics. 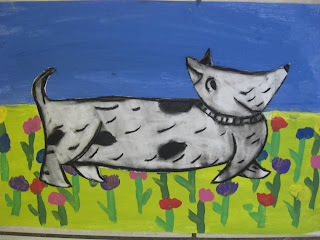 A final coat of Mod Podge gave them a nice glossy finish. 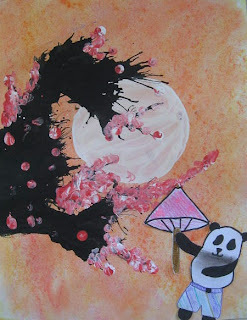 These were a lot of fun to create. 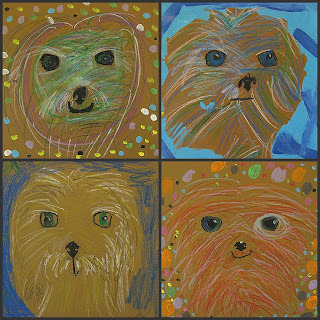 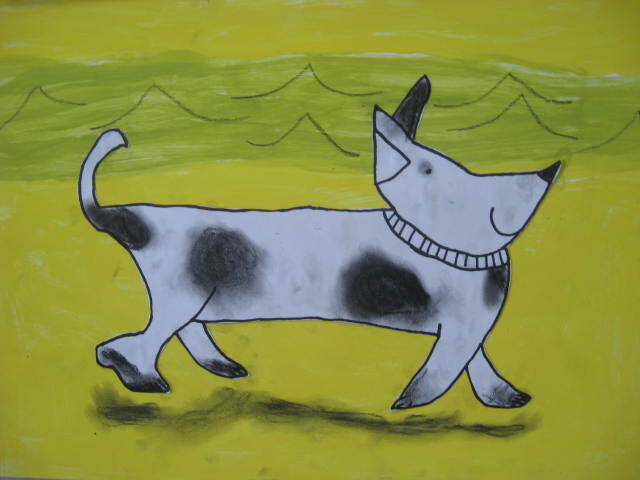 My younger students in Animal Art Fun used a photo of "Dylan" (below) from the SPCA of Northern Nevada to create their expressive dog drawings in oil pastel. 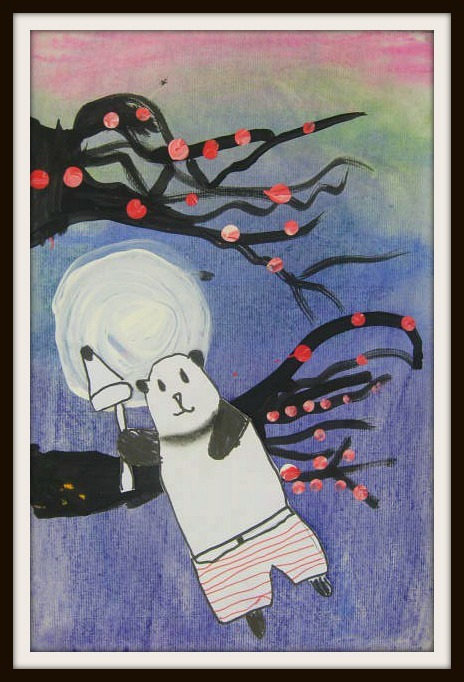 I love all their individual and creative interpretations.